This machine offers: Portability, versatility and easy use. 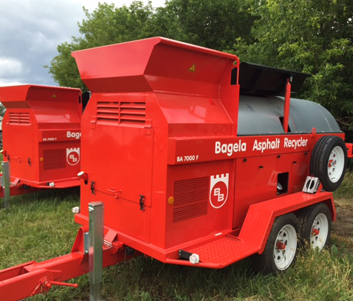 This user friendly, German engineered, Bagela line of asphalt recyclers is designed to use existing chunk asphalt or millings to recycle into viable hot mix. 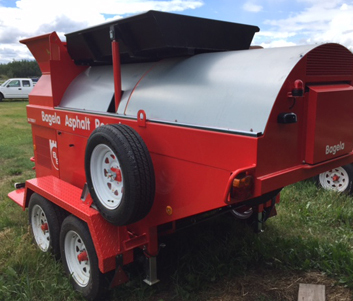 How this process works, is quite simple, old asphalt is loaded into the hopper using a patented heating process and recycled back into hot mix asphalt in as little as 8 minutes. The patented flighted drum keeps the material from coming into direct contact with any flame, so output material is discharged at a consistent temperature, which is monitored by electronic controls, making operation very simple. This machine will save up to 80% versus purchasing plant mix providing, all weather paving eliminates cold patching and returning for permanent repair. Use it for highways to driveways. The versatility that Bagel fits the needs of contractors, MOTs, Municipalities, and Counties.